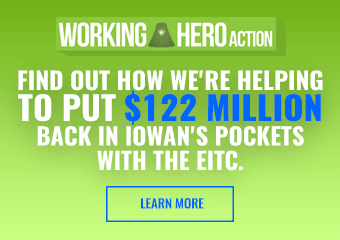 It’s a little under a year out from the Iowa Caucus, and presidential candidates are already inundating the state to make their pitch to local activists. What’s particularly fascinating from these initial visits is that the Democrats’ campaigning and event styles are just as diverse as the field itself. You can already start to see hints of how each candidate’s strategy in the caucus will play out by how they structure their first trips. Starting Line thought it would be helpful to compile all our brief observations on the candidates’ approaches into one piece. With a field this large, unless you have a perfect memory of all the individual news stories that come out of Iowa, it can be difficult to get a big-picture view of how the candidates are comparing to one another here. I’ll be doing several stories like this where we try to take a step back and look at how the on-the-ground organizing and campaigning is playing out. I’m including the rough estimate of the range of the attendance at their various events. However, you should only read so much into these numbers right now. Some campaigns intentionally schedule smaller events early on so the candidate can get more personal conversations in with local Democrats to better understand their issues. Frequent Iowa snowstorms have also impacted some trips. Locations: Council Bluffs, Sioux City, Storm Lake, Ames, Des Moines, Ankeny, Cedar Rapids, Iowa City, Davenport. Warren has completed two swings through Iowa, one right after her exploratory announcement (during great Iowa weather) and one immediately following her official announcement (during terrible Iowa weather). She quickly produced the most eye-popping crowds on her early January visit, which began in conservative Western Iowa. The well-staged, professionally-run events showed the benefit of a having a large national political infrastructure. Even before most of her Iowa staff were hired, Warren’s events on her first trip were very efficient affairs, running attendees quickly through a selfie line after her remarks were over. The senator also did a good job of personally addressing the overflow crowds and even taking questions from them before heading into the main room. Not every politician does that. Warren’s stump speech on her first trip was relatively short, only spending about 10 minutes on it before taking audience questions. 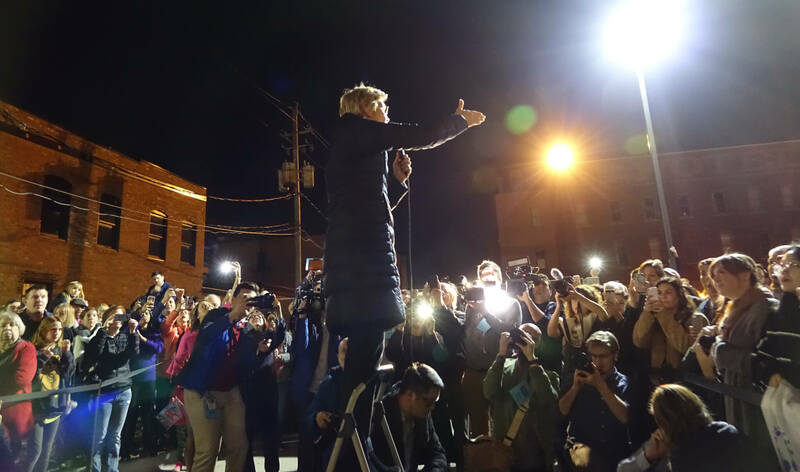 Warren usually had the local county party chair or legislator introduce her; that person also helped randomly select who got to ask a question through a lottery ticket system, a method necessitated by the large turnouts. The senator’s speech went for about 25 minutes on her second trip. Their campaign also held a few panel-style events. 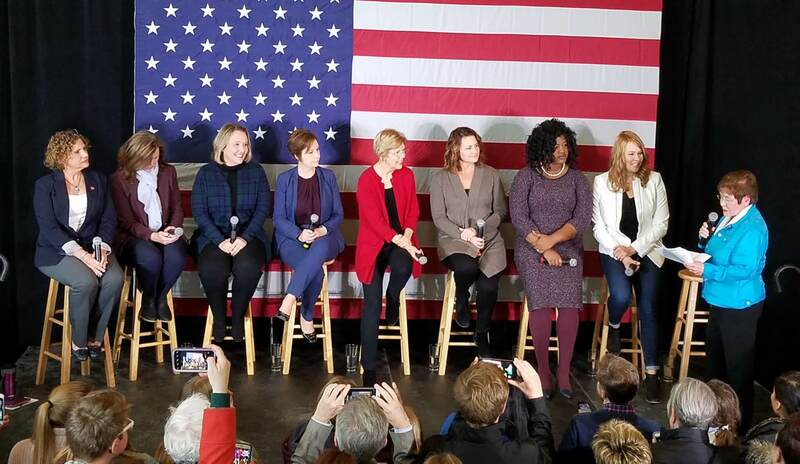 Newly-elected female legislators and former candidates joined Warren on stage in Ankeny; labor leaders helped lead a discussion in Davenport. Locations: Cresco, Mason City, Clear Lake, Perry, Waterloo, Dubuque, Clinton. The Ohio senator’s Iowa tour was by far the most unique of any 2020 Democrat, and the stops they picked (and didn’t pick) were meant to drive home a message. 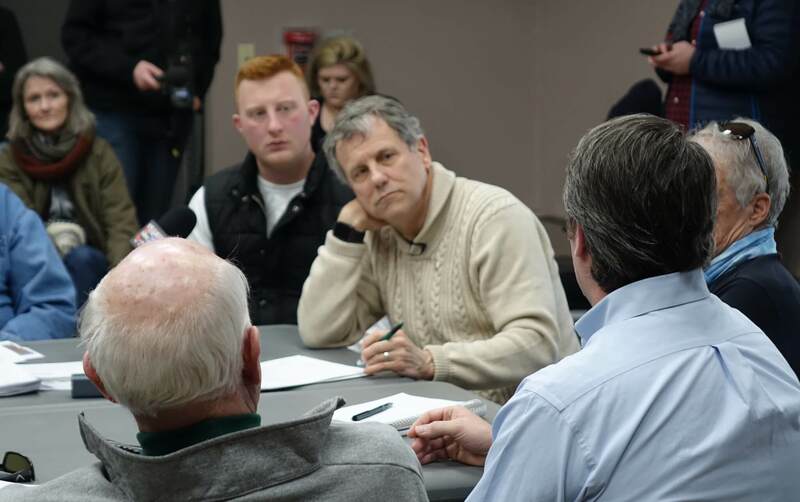 Brown began in Cresco, a rural town of under 4,000 people, in the county that underwent a 40-point vote margin swing from Obama to Trump between 2012 and 2016, the largest in the entire country. He stayed away from the deep-blue, larger urban cities of Des Moines, Cedar Rapids, and Iowa City. He essentially took a tour of the rural and blue-collar counties that were Democrats’ undoing in Iowa and the Midwest in the 2016 election. 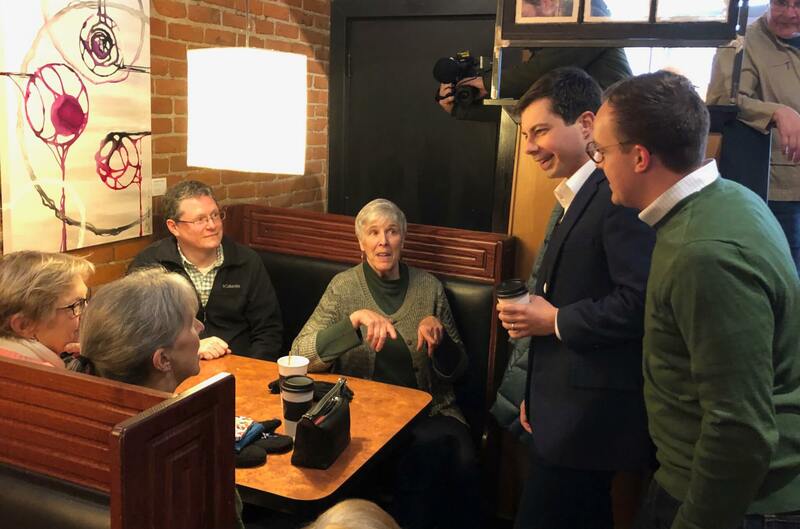 The trip was a mix of venues: a house party, a farmers roundtable, a panel discussion on poverty, a meeting with labor leaders, and a more traditional caucus gathering of Democrats at a Dubuque coffee shop. Brown was probably the most on-message of any Democrat. He kept tight to his “Dignity of Work” tour message, pivoting back to working-class themes on nearly every answer. Since this was more a testing-the-waters trip before an official announcement, the focus of his pitch was more narrow. Brown was joined by his wife, Connie Shultz, who gave very touching introductions of her husband at each event and helped mingle with attendees afterward. Locations: Mason City, Waterloo, Cedar Rapids, Iowa City, Marshalltown, Des Moines. Oh man, were these long events. Several of Booker’s Iowa stops lasted past the two-hour mark, from his initial speech to selfies to press gaggle. His stump speech stuck almost completely to biography and big-picture aspirational themes, leaving all policy talk to the Q&A section. On that policy front, however, he was happy to delve deep into topics like affordable housing, using his personal experiences from leading city government to give extensive answers. Booker’s first trip was interesting in how it showed off the significant political relationships of his Iowa team. He hosted a panel of younger, up-and-coming elected officials from Eastern Iowa in Cedar Rapids, and a group of state and local officials in Des Moines, including Senate Democrats Leader Janet Petersen. Former House Leader Mark Smith hosted Booker in Marshalltown; Booker’s political operation sent considerable assistance to Iowa legislative races in the midterms. The senator spent some long hours on the trail, meeting with a group of College Democrats late on one evening and chatting with a key Northern Iowa activist long into another. He also kicked off his visit with a family reunion (Booker has a lot of extended family members who live in Iowa). Locations: DeWitt, Tipton, Davenport, Des Moines, Glenwood, Council Bluffs, Sioux City, Denison, Fort Dodge. While other newly-declared candidates were making their first big splash in Iowa, Delaney was lapping the field and then some. 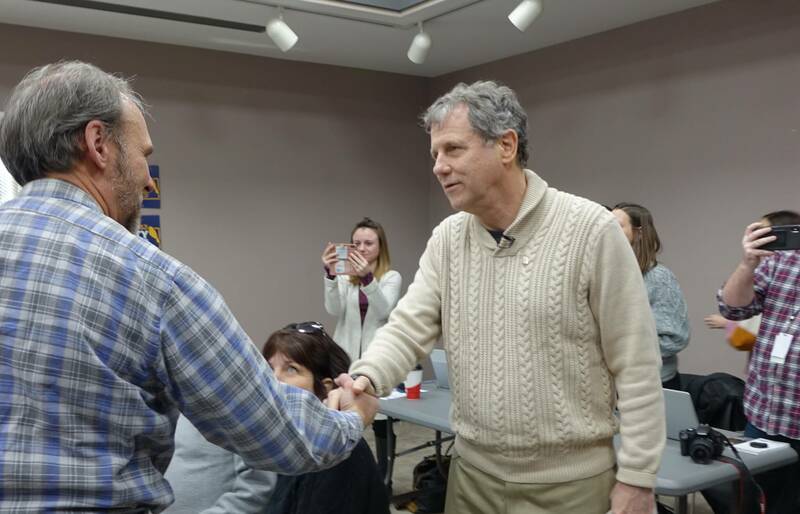 Already into his second 99-county tour of the state, the former congressman hit up small towns to meet personally with activists who might not see the front-runners in their county for another several months. Building crowds in those places for an underdog candidate isn’t easy, but Delaney has built out a sizable field effort that is already burning through phone lists. He also held several campaign field office openings this past month. Most other announced candidates don’t even have an Iowa headquarters rented out yet. 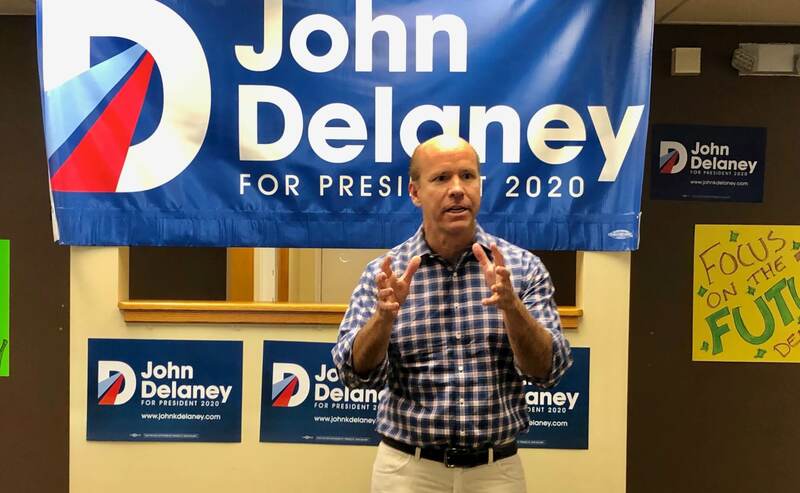 Sometimes when Delaney stops in a larger city like Davenport, he’ll do a special “America 2030” presentation, a slick multi-media affair where he takes folks through a fancy powerpoint. It’s kind of like Al Gore’s old An Inconvenient Truth presentation, but focused more on economics and technology. Locations: Sioux City, Boone, Ames, Des Moines. The New York senator’s initial Iowa journey felt like the traditional early-caucus swing, with mid-sized crowds of Iowans in coffee shops and beer halls meeting a national politician for the first time. Gillibrand also did several main street walks, dropping in on local business owners to chat. She seems to be the candidate having the most fun on the trail, and she got a chance to bake some cookies at one Des Moines kitchen supply store. Gillibrand started her trip in Western Iowa, possibly a nod to her electoral success in a conservative Upstate New York congressional district. 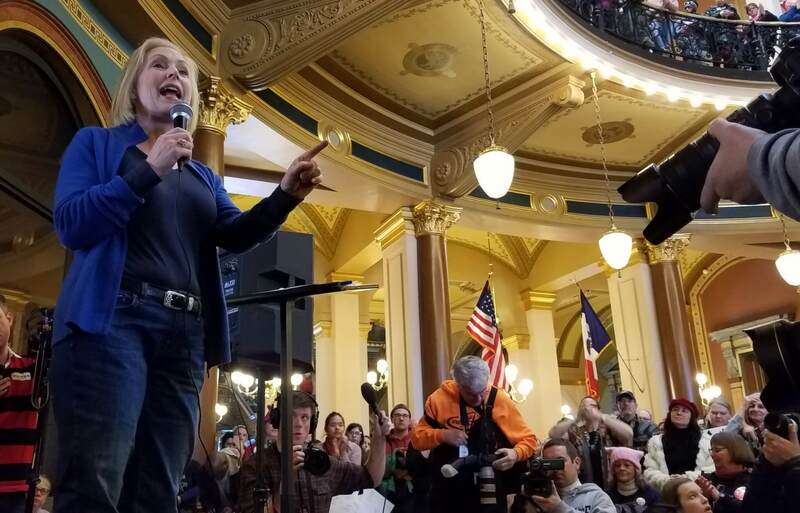 She also took the chance to speak at the Women’s March in Des Moines. A third day swing through Eastern Iowa got cancelled due to weather. Gillibrand gave possibly the best rally speech of the field at a packed Des Moines event. That might signal that she could be one to break out at one of the big Democratic Party fundraisers this year that brings in all the candidates to give their most passionate speech. Locations: West Des Moines, Des Moines. Like beer? Then you might want to follow around John Hickenlooper on his campaign trips. The former brewer-turned-mayor-turned-governor likes to stop in at breweries during his visits, where he’ll often give his own review of a local Iowa craft beer. Hickenlooper did a quick trip out to Iowa to test his potential message, going to a house party hosted by an old Iowa friend of his. The former governor’s speeches so far have focused primarily on specific policy accomplishments he achieved in office in a purple state. The California senator headed straight to Iowa after her official announcement in Oakland. 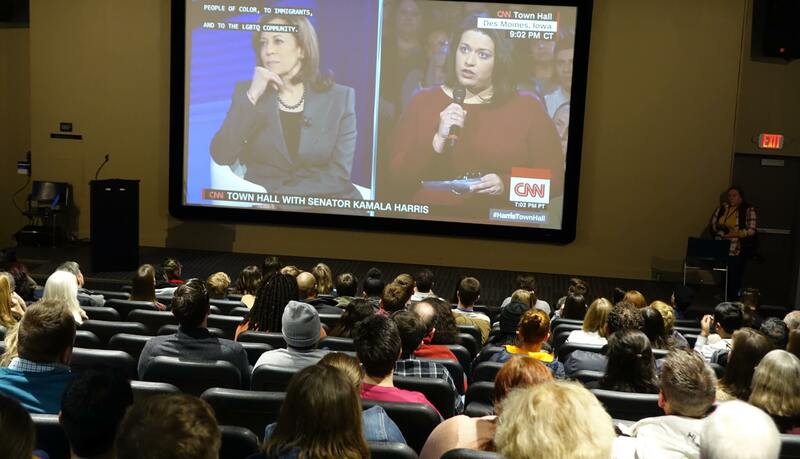 She only had one stop on her itinerary, a national town hall forum with CNN at Drake University. CNN distributed tickets, and a large overflow group of students and activists filled a nearby campus theater to watch. Harris came by that room afterward to give a quick speech and take a few questions. Obviously, were this the only kind of format that Harris uses in Iowa, that would be problematic, but it won’t be. She’s got a two-day return trip scheduled for late February, and we’ll learn a lot more about her campaigning style then. Stay tuned. 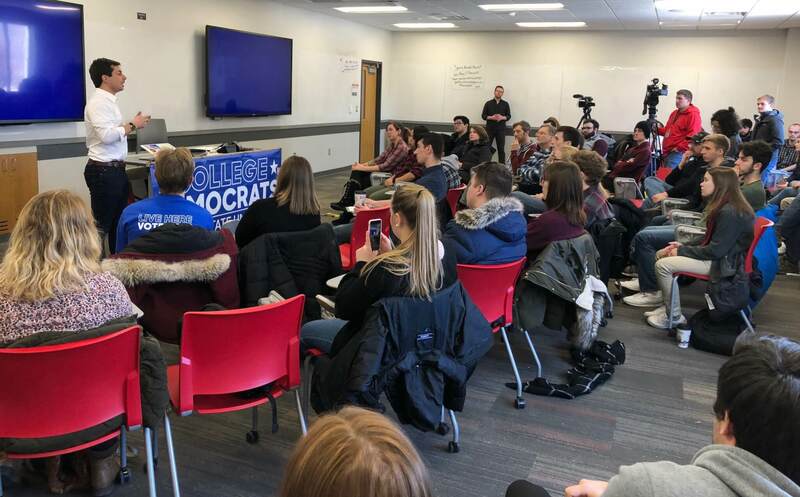 Not too well-known nationally yet, Buttigieg stuck to events with the core activist crowd that are familiar with him and college town visits where he can draw young people out to see his millennial candidacy. He had probably the shortest stump speech of any candidate, taking just five minutes to introduce himself before jumping into Q&A (which, as I wrote, he’s very good at). Buttigieg is another candidate where the spouse could make an important impact on the campaign trail. His husband Chasten joined him, chatting up attendees before and after events. Locations: Des Moines, Iowa City. A Marianne Williamson event is an experience. The best-selling author’s stump speech is the longest of the 2020 field, typically lasting around 45 minutes. It’s part history lesson, part big-picture vision, and part progressive policy discussion. Her answers in the Q&A section can go quite long, as well, sometimes pushing events to a longer runtime than Booker’s. She also sometimes has local musicians perform beforehand or a poetry reading. She held several private house parties while in Iowa, doing more intimate gatherings with early supporters. 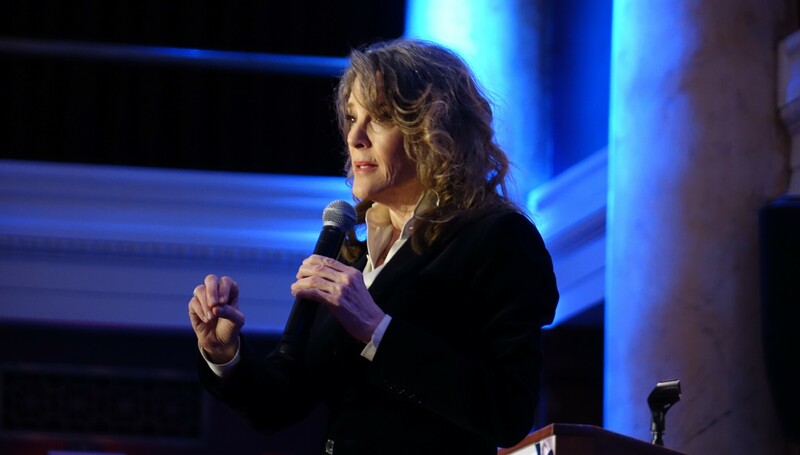 Williamson, known for her self-help and spiritual books, pulls from a much different crowd than most candidates. 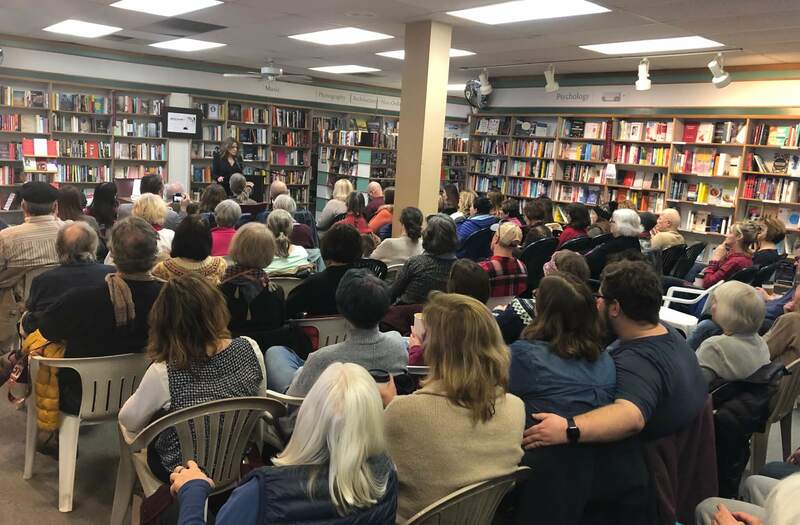 She got a large turnout for her Iowa City event, where her brand of very progressive policies and unique personal appeal resonates well. Locations: Iowa City, Indianola, Pella, Grinnell, Jefferson, Carroll, Denison, Sioux City, Johnston, Ames. 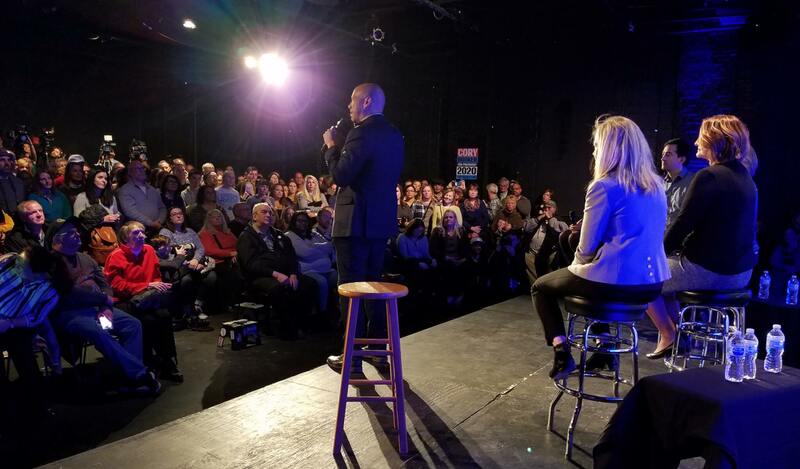 Just like during the midterms, when Yang makes a visit to Iowa it’s typically a substantial visit with a lot of various events. He mixes small house parties with larger meet-and-greets with county activists, and then does a couple fun things like a ride-along with a trucker to talk about automation. 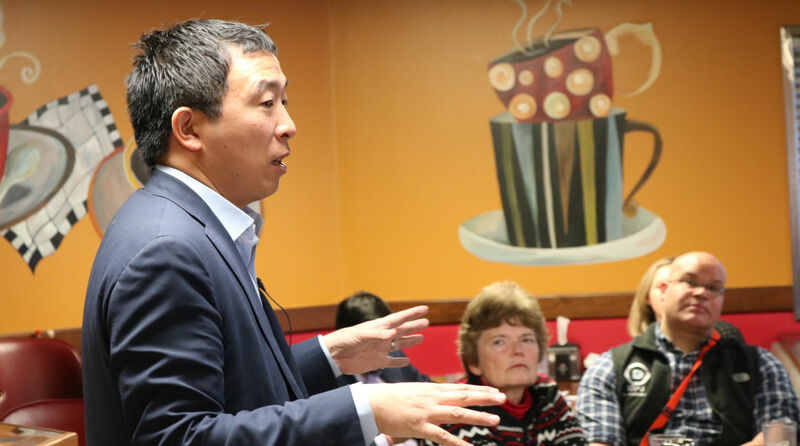 Yang, whose central pitch is supporting a Universal Basic Income “Freedom Dividend,” typically sticks to in-depth policy talk on his journeys. Locations: Des Moines, Fairfield, Iowa City. Lousy weather cancelled Gabbard’s first Des Moines event, which was shaping up to be a very well-attended gathering (the same snow unfortunately kept Starting Line from her other events). Her choice of Fairfield – home to the Maharishi University – was noteworthy, as the unique small town in Southeast Iowa has a political vibe that is more outsider than it is liberal (though it’s still very liberal), a perfect match to her own profile. Gabbard spoke from a podium in Fairfield, touching on more foreign policy topics than any other candidate has. She didn’t take questions after a 20-minute speech in Fairfield, but did in Iowa City. For those keeping track, Swalwell visited Iowa more than anyone during the midterms save for John Delaney. He did a quick stop into Linn County for two brief events in January, but hasn’t been out much yet this year. Swalwell came out for a lot of one-off events in 2018 where he’d headline a local party fundraiser. When he jumps in the race officially, we’ll get a better sense of what his caucus campaign looks like. Locations: Cedar Rapids, North Liberty, Iowa City. Castro had only one low-profile swing through Iowa a week before his announcement; his next trip is in late-February. 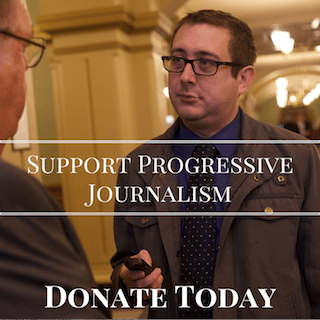 The January trip focused on connecting with key activists in Eastern Iowa. When he visited Iowa last year, Castro’s events were geared toward his electoral strengths among Latino voters and younger voters. We’ll know more about his campaigning style and appeal on that next visit. Your numbers for Tulsi Gabbard aren’t even close. She had at least 200 in Fairfield and a packed house in Big Grove Brewery. Just look at Youtube for her events. What method did you use to get the numbers–Trump math! Her second event was at the Fairfield Arts & Convention Center at 12 p.m. in Fairfield, Iowa. This event had significant attendance, with 200 people showing up, Des Moines Register reported. Gabbard said that she would seek to bring “service above self” during her presidency. She also spoke about Medicare for All, improving immigration, and ending government shutdowns. Appreciate the broader view. Thanks. Hope these folks will come to real rural Iowa. thanks . Joe Murphy Murphy Sound. I like Warren and dislike Gillibrand, but I have to say, from what I’ve seen those two had the most engaged swings. Gillibrand playing the crowd and answereing questions among the partipants, and Warren giving a short (relatively) stump speech and taking lots of questions from the attendees. It was obvious that both spoke from the heart in their answers. 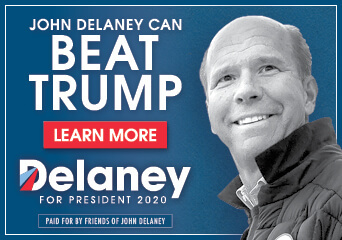 Delaney’s been running in Iowa since before the midterms; I know he’s been advertising for staff here, but has he really gained all that much traction from his visits here? I have to give him credit for ambition – his second 99-county swing? Impressive. Cory Booker? Don’t know what to make of him. I LIKE him, and he is certainly passionate. I’ll have to see what he says when Rachel Maddow interviews him tonight. 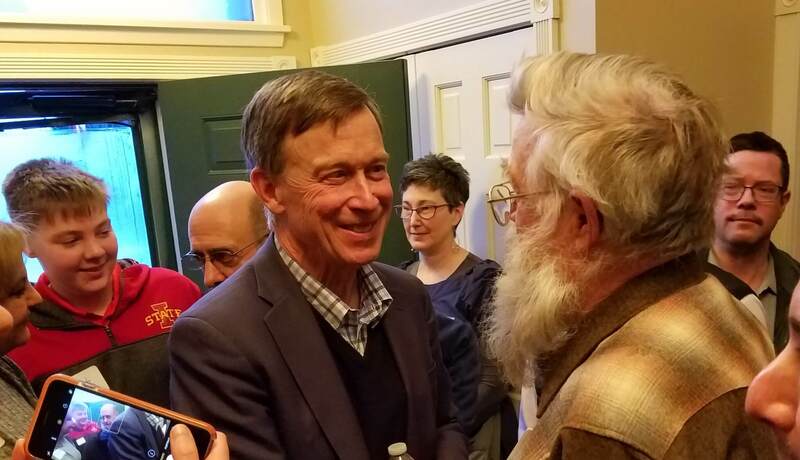 I have a soft spot in my head, err, heart for Hickenlooper. I’m from Colorado. 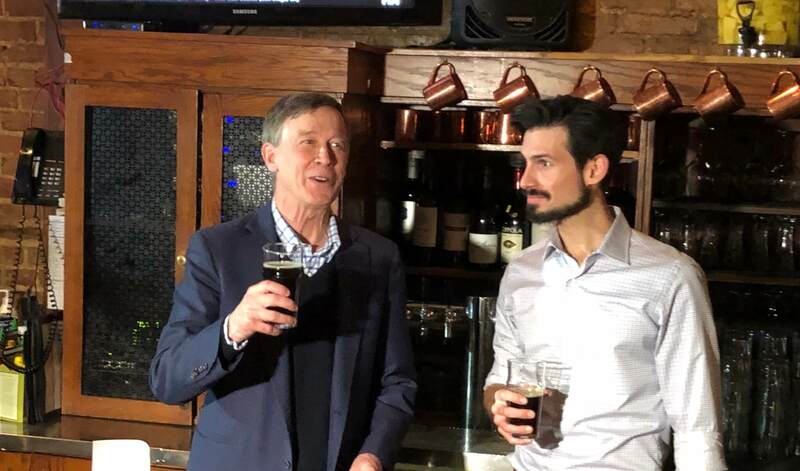 He’s not only a “I can have a beer with this guy” candidate; he’s politically astute (he wouldn’t have been mayor of Denver and then Governor of the state if he weren’t). 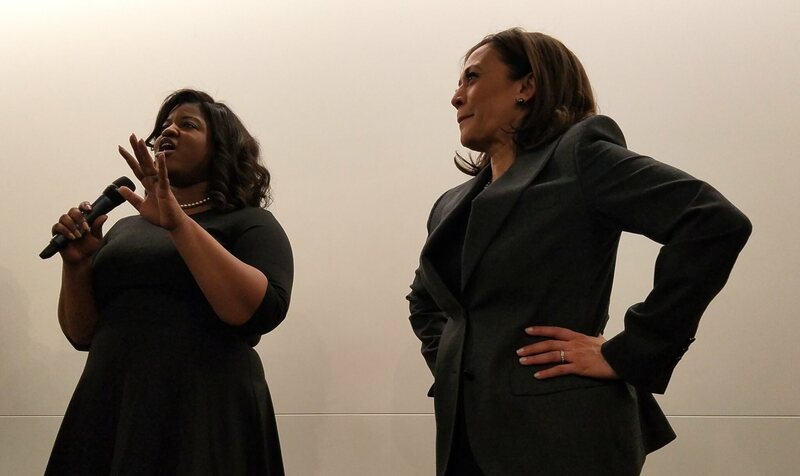 Kamal Harris is still my candidate, but I’m hoping that, on her next swing, she is more of the Warran/Gillibrand type in dealing with the audience. Thanks for this, Pat! I’d love to see more of these analyses! After seeing Amy Klobochar’s announcement speech in a snow storm on the banks of the Mississippi River, and hearing her interview with Rachel Maddow, I am very impressed.